Social media channels are becoming all-in-one platforms where you can get almost everything. Case in point is the addition of the new food ordering feature directly on Facebook (NASDAQ:FB). 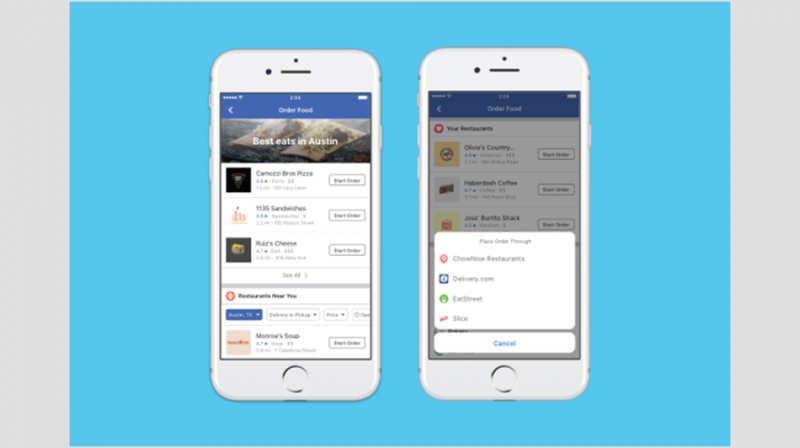 After a year of testing, responding to feedback and adding new partners, Facebook is rolling out a feature allowing small restaurant owners to offer food for order on the platform. Using your Facebook page, your customers can now order from your restaurant for delivery or pick-up. And if you don’t deliver, they can use one of the many delivery sites Facebook has partnered with to provide the service. For small business owners in the restaurant industry, the internet and social media have introduced affordable channels to attract new customers. In the case of Facebook, this includes the two billion peoplethat use it every month. The food ordering integration is a win/win for customers and restaurants, as they will meet on a platform they both use. Facebook is bringing together ordering services such as EatStreet, Delivery.com, DoorDash, ChowNow and Olo along with national chains like Panera, Five Guys and others in one place. This also includes hundreds of local restaurants too. When customers find your restaurant, they can see what their friends and other customers think about it by looking at the reviews and comments being left. Then all they have to do is click the Order Food tab in the Explore menu to browse the restaurant. Once they find you, they can click StartOrder to order for delivery. If your restaurant doesn’t deliver, customers can sign up for a delivery service and get their food that way. And best of all, they can do this while still on Facebook without having to go to another site. If you still don’t have your restaurant on social media, Facebook’s new feature is one more reason to do so. Here are some more. According to a study by GlobalWebIndex, 42 percent of internet users in the U.S. are regular eaters of fast food. And 44 percent of them are likely to interact with a brand on a mobile app, while 24 percent are likely to follow brands on social media. Meanwhile, 28 percent are more likely to opt-in for personalized loyalty rewards from brands. And the best way to get a hold of these users is with a strong online presence that includes social media. Facebook says the new service is rolling out everywhere in the US on Android, iOS, and desktop so it may be time to learn more about how you can use it to your best advantage.